Hi! Im frogggggg. 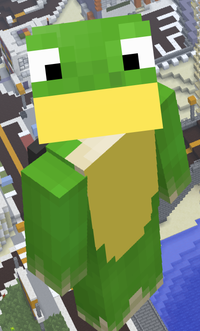 Also known as: Villager45_Dugan, AGpro_Dugan, DawnOfTheDugans, FroggymanMC, _Frogs4Life_ (My wiki name), _RegularFrog_, _HalloweenFrog_, and finally, frogggggg as I am now. Anyways, I joined the 8th of November, 2015. I wanted to join this server because I thought it would be great to socialize and build towns with other people! I didnt know that I needed to apply, but, guests you know... But the main reason I joined is because I LOVE transportation and I thought the name 'minecartrapidtransit.net' was pretty transportational. It took me FOREVER to get Member. I even got it on my 6th try. :3, I probably just didnt read the rules correct or I was just horrible at keyboards at the time. Either way, I actually managed to get it! (Dont tell anyone but I got vetoed once for Trustee, SHH). My first town I ever made was Crossfern T39. I was very excited to finally have my own town! But Crossfern turned out horrible... It was floating, it had unfinished builds, and in general the shape was ugly. I was satisfied for the first month but then it got messy. I really wanted Mayor to start fresh and get a new town... But tbh I had fun building even if it was bad! The day finally came and I got promoted to Mayor. I was speechless! I was thinking of the new town if I wanted to do it or not, but at the end of the day I decided I would. I was checking my brain files until I remembered this name I always hear in my household: Titsensaki. Idk what it means but I used it. And I really do like it =D. Btw the town was at NE18. Then that december, I decided to run for Senator, unfortunately I did not get it the Feb. batch but, better luck next time Frog! But I wanted to own something small but have a very good infrastructure, so I made Terredunord. It didnt turn out SO well, but it was nice! Its in one of the new Epsilon Islands! Anyways, to this day im thankful that I was able to make it here and have such a firm hold to the community! Thanks!